As the groundbreaking children’s series celebrates five decades with 150 million viewers, its producers offer The Hollywood Reporter extraordinary access to Big Bird, Cookie Monster and the minds behind one of media’s only universally loved franchises — and reveal how a $100 million-a-year mainstay nearly went out of business. 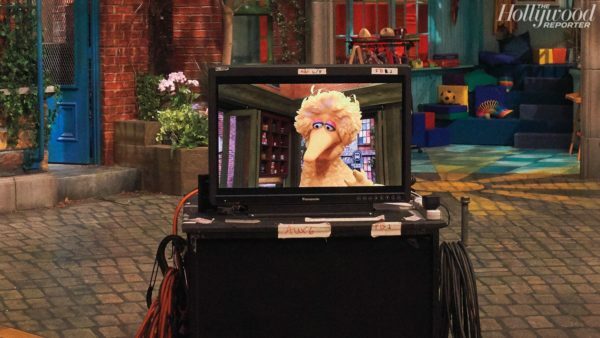 Her name is Carmen Osbahr and normally she operates Rosita, Sesame Street’s Latina Muppet. Right now, though, she’s squeezed into a cupboard along with four of her colleagues on the show’s Queens, New York, set, where they’re about to shoot a bit in which Elmo and Big Bird wander into Hooper’s Store looking for snacks. A few minutes earlier, a stagehand with a circular saw sliced a half-moon chunk out of the wooden surface so Osbahr and her fellow puppeteers could reach up and manipulate a crate full of talking fruit — an apple, peach, pineapple, banana and orange — while doing their best not to elbow each other in the eye or stick armpits in each other’s noses. Many things have changed on Sesame Street over its remarkable 50-year run — like, say, the fact that viewers now have to pay HBO to watch new episodes when they’re first released — but this is not one of them. They still operate Muppets the old-fashioned way, with a human hand shoved up a felt hole. There are a few TV shows that have been on the air longer — Meet the Press, Doctor Who, The Tonight Show — but none has made a bigger impact, or at least taught as many people the alphabet. Sesame Street didn’t merely revolutionize children’s television; it changed perceptions of what the medium was capable of and, along the way, gave PBS its biggest, most enduring hit, a show that today reaches 150 million children across the globe. My 3 sons born 1975, 1981, 1986 all watched Sesame St. While they watched and learned from a bunch of kind caring sensitive puppets. I doubt any parent ever entered a room , saw that Sesame St was on and said thats enough TV and turned it off. More often than not I would sit and watch the show and marvel at how efficiently it was teaching my kids everything from spelling and math to empathy, sympathy, sharing and even grieving. My favorites were Cookie Monster, Oscar, and the Count.